Bare Snacks Fruit Chips Giveaway! If you are looking for a healthier way to snack – fruit chips may be the way to go! Full of nutrient, vitamins and other good for you stuff, Bare Snacks offers a ton of great apple and now, coconut chips! Krista over at Savory Savings recently shared her thoughts on the new coconut chip line – be sure to check that out! How would you like to win an assortment of fruit chips from Bare Snacks? If you would like a chance to win, enter with the Giveaway Tool below. If you have won a Bare Snacks giveaway anytime from another blog in the last 12 months, you are not eligible to win this giveaway. The giveaway will run from August 12 through August 26, 2014 at 11 PM CST and is open to US residents, ages 18 and older. Entries will be verified. Winners will be notified via email (consider adding gloriouslygreengal@gmail.com to your safe list) – winner will have 48 hours to respond and claim prize or another winner will be selected. And she thinks these English-style chips are the best out there! If your looking for a healthy snack for your family, Check Out Beanitos. They are giving 1 winner a case of snacks. Cheshire Cat's family tried and loved Beanitos. Her toddler in particular just devoured them. Read The Cheshire Cat’s full review and check out some recipe ideas here. Barb S. is the winner! We cook our proper English chips by hand in small batches here on our farm in Herefordshire. And we always leave the jackets on. Well it’s only polite. Tyrrells chips has a flavor for everyone. 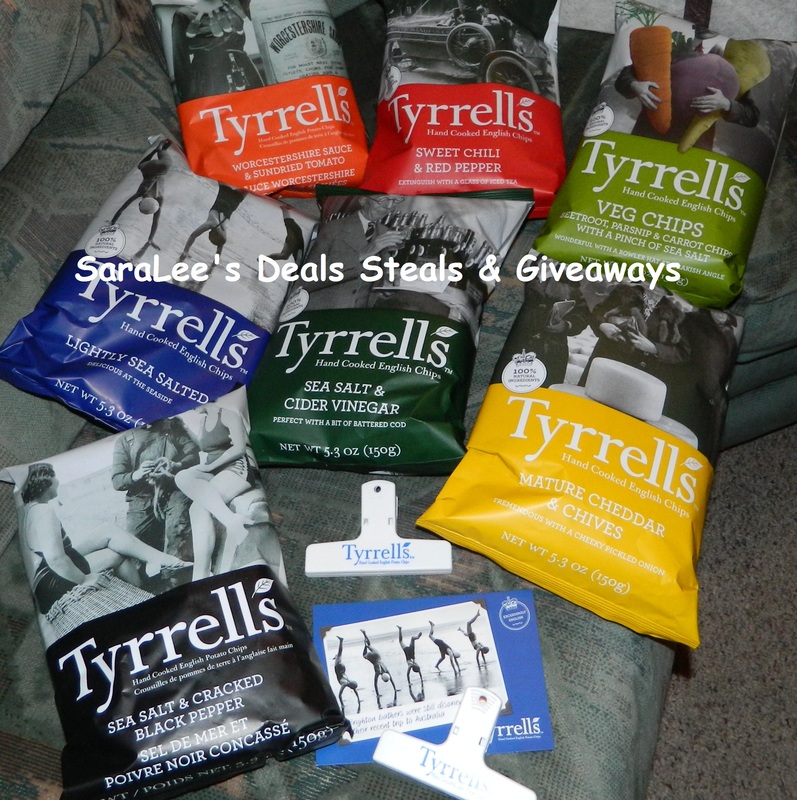 I never heard of Tyrrells before I did this review and I am glad I found them. I like how the chips are crunchy and have a flavor not like any of the other chips I have been eating. My friend that was over asked if the could try the Veg chips and I said go for it. I watch to see if they got the oh yuck face because I didn't think the Veg chips would be any good but to my surprise my friend just kept eating chip after chip. I finally asked to try one my self and couldn't believe how good the chips tasted. Before I knew it we had finished the bag. Now my friend is buying the Veg chips thanks for me getting them to review. I was happy to find that I can buy Tyrrells at over five (5) stores by me. My favorite is the Lightly Sea Salted. The chips are crunchy and don't have an over powering salty flavor like other chips tend to have. My husband likes the Sweet Chili & Red Pepper chips as they have the right amount of kick. My son likes the Mature Cheddar & Chives. Like I said Tyrrells have a flavor to please everyone. When I go to a store that sells Tyrrells I will make sure to grab a bag or two before I leave the store as the chips are just that good. You can connect with Tyrrells English Chips on Facebook or Twitter. 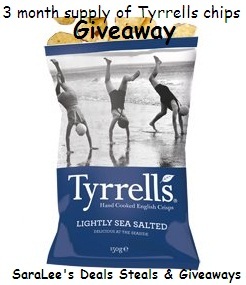 Now for the giveaway: One lucky person will win a three month supply of Tyrrells chips. This is open to US and ends 6/18/13 @ 11:59 pm est. To enter, Simply do the tasks on the Rafflecopter widget below and you're set to have a chance to win! Remember you can't win if you don't enter. It only takes one entry to win! 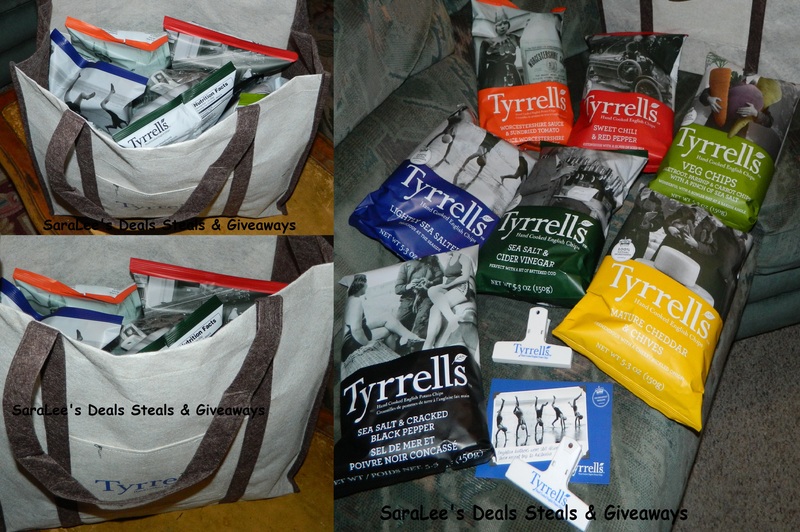 Disclaimer: I got the Tyrrells chips free to do this product review & giveaway and was not paid for my response. Please note that SaraLee's Deals Steals & Giveaways are not responsible for sponsors who do not fulfill their prize.